After conquering the Milestone 0 in A Pa Chai - extreme western point of the country, finally we decided to go back to Mu Ca - Pac Ma in Muong Te district, Lai Chau to participate in traditional festival of Ha Nhi people. The Mu Ca Pass - Pac Ma rod is as beautiful as Lo Xo Pass in Truong Son mountain range, because it is not only winding but also green thanks to the forest two sides. The random luck - our trip dropped on the right time of Ha Nhi people’s traditional New Year holiday - made us stay in the North West region in 3 days. Muong Nhe and Muong Te are home to the Ha Nhi. They have a close relationship for centuries but the New Year festival time is not the same. It depends on the situation of the local reality and decided by the arrangement of the community. Nevertheless, according to tradition, the festival of Ha Nhi people is held in the Dragon day and after harvesting crops. This year, the Ha Nhi in Ka Lang valley (Muong Te) organized the holiday in October, while in Mu Ca commune of Muong Te, they choose to hold it in November and Sin Thau Commune - Muong Nhe arranged in December. From early morning, when Pac Ma town on the bank of Da River was sleepy, we drove nearly 20km back Mu Ca commune center. This is where wind and clouds created a romantic magical cene, making us not want to drive fast. At that time, the Ha Nhi people already prepared offerings for their ancestor. Under the guidance of the villagers, we visit Mr. Po Long To- researcher and artist of Ha Nhi ethnic. Despite how busy the worship rituals of the new year, he still spent time to explain coherently each ancient tradition: The alter of the Ha Nhi is always divided into 3 compartments for ancestor worship, the shaman and the deity who protect them. The offerings include white wine and pork soup. However, it’s very strict in which part to offer each part: pork leg is for ancestors, the thigh is for the shaman ad the deity who blesses the family. Also they do not burn incense when doing the ritual. Although the Ha Nhi stay afar or being busy, they always put the business or job a side to come back home together with family in New Year holiday, commemorate their ancestors and visit relatives. Mrs Vu Ha De living in Muong Nhe, once a year, travel more than hundred kilometers to come home with her mother and brothers. It’s no exception for the people who work in Hanoi or even the Central. According to the concept of the Ha Nhi, visitors coming to the home in this occasion is a good luck. However, not drinking alcohol is taboo. So wine glasses constantly brought and hence almost guests are drunk when they leave. Though the Ha Nhi is widely known as generous and friendly people, the rule in the family is very strict, for example, daughters-in-law do not sit together with their husband’s father and brother in the meals. Additionally when guests visiting their home, women are less likely to appear. There is a small village of 21 households living scattered among the green forest and mountainside in Cu Xa Vilag, 15 km from Mu Ca to the south. The village overlooks the Nam Ma streams which is full of water year around, creating a wild and dreaming landscaped. If there’s no bridge crossing the spring that people use everyday, Cu Xa would be completely isolated from social life. The life of the villagers, though not affluent, but stable with annual agriculture and the payment paid by the government for forest protection. Thanks to that, the forest area around Cu Xa in particular and in Mu Ca in general is strictly preserved. We traveled here because of the good reputation of traditional rituals and custom of ancient Ha Nhi people. 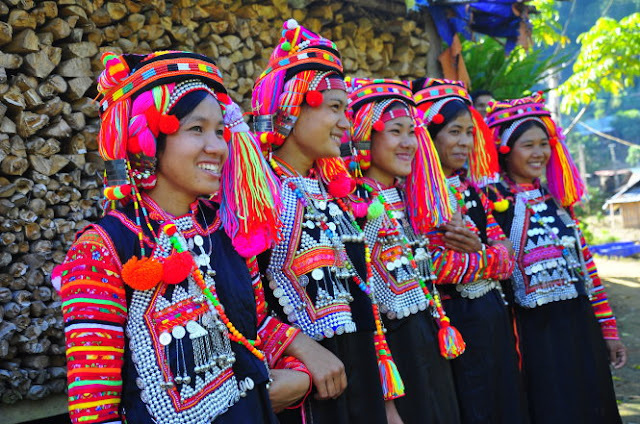 The women of the villages are diligence, faithfulness, and very skillful in embroidery brocade fabric and clothes. We stood on the banks of streams and watched groups of young people passing through the small bridge to visit their friends and relatives on New Year day every now and then. Sometimes the sound of gongs and drums signaling the beginning of the new year seemed to hook up us to stay overnight and attend the traditional Xoe dance performance. At night, the breeze blowing through carried the cold of the mountains. The sound of gongs and drums resounded, then the beautiful girls in brilliantly colorful ethnic costumes like flowers blooming would dance together throughout the night. The northwestern land always keeps something new and unique. And in every trip we discovered many interesting things. With the journey back to Muong Nhe and Muong Te of us at this time, having chance to attend Ha Nhi ethnic new year festival in the middle of the green forest is a rare fate in life. This is best travel blog articles which provides Lai Chau unforgettable memories of there. It is one of the most beautiful places of the World. You have an opportunity to gives the memorable trip experience.